I love adding Del Monte Whole Kernel Corn in fruit salad. Actually I only learned this from my Boss. taste of fruit salad so since then it has become one of the regular ingredients of my fruit salad. But just like my Boss I had to make sure the brand is Del Monte if not I rather would not add whole kernel corn anymore. Well you may ask me why. The reason is that I once tried a different brand and it ruined my salad. That kernel corn is not as soft and good tasting as Del Monte. out of stock during the holiday season so that if I would buy this during the peak hour, I certainly would not be able to get any can anymore. if I failed to remember doing this and I run out of Del Monte Kernel corn, I would rather not put any kernel corn in my salad anymore. 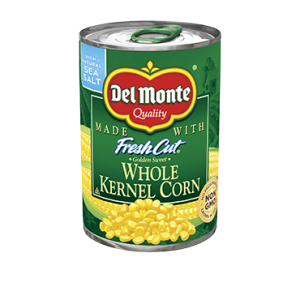 I think no other brand of Whole Kernel Corn could match the perfect softness and goodness of Del Monte. Why did the other salad, ruined your taste. What was it about it that ruined your taste . The other brand does not have the perfect tenderness of Del Monte Kernel Corn. The kernels are hard on the teeth and does not have the naturally sweet taste of Del Monte too. Yes i agree with, so for me i think its not bad if we buy this product earlier.all we have to do is to check the expiration date.